Thank you for the support and making this benefit nearly sold out and a big success! We hope you check back with us for the next proposed benefit for December 2020. Empty Bowls is an international project to fight hunger, personalized by artists and art organizations on a community level. The project is an opportunity to help feed the hungry in the Youngstown, OH community. 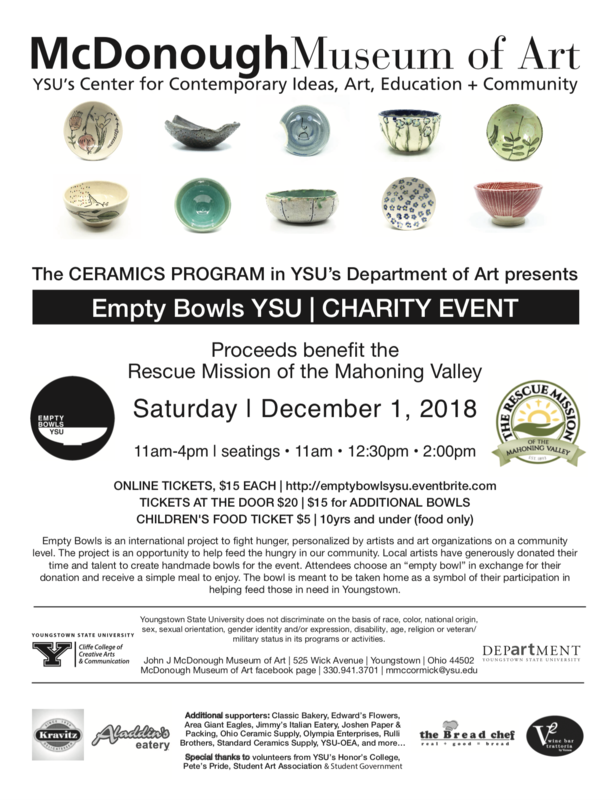 Local artists have generously donated their time and talent to create beautiful handmade utilitarian bowls for this special event. Attendees choose an empty bowl in exchange for their monitary donation and receives a simple meal to enjoy in a community setting. The bowl is meant to be taken home as a symbol of their participation in helping feed those in need in Youngstown. Proceeds have benefited The Rescue Mission of Mahoning Valley. The only emergency shelter in Mahoning County, the Rescue Mission of the Mahoning Valley hosts an average of 130 people nightly and, in 2016, served on average 631 meals daily.